MUTATOR EVO provides a combination of sound design tools for creating unusual, weird, and otherworldly voices. 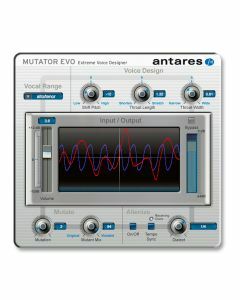 MUTATOR EVO's voice processing tools are divided into three functional sections. The Voice Design section lets you use our unique throat modeling and pitch shifting technologies to craft the basic characteristics of your voice. The Mutate section lets you transform and mangle that voice into a variety of strange creatures, with a selection of 24 different varieties of "mutation" created via pitch-tracking ring modulation. Voice Design -This section let's you use the unique vocal modeling technologies from Antares' THROAT Evo Vocal Designer to create the basic vocal characteristics of your voice. Mutate -Having created your basic vocal characteristic with the Voice Design controls, the Mutate section let's you turn that voice into a variety of, how shall we put it, alternative entities (i.e., weird creatures) by letting you select among 24 different varieties of "mutation" created via pitch-tracking ring modulation. Alienize -Finally, the Alienize section lets you give your speech the quality of an alien language by chopping it up into small segments and playing each segment in reverse. You can create your own unique language by varying the length of the speech segments, or even syncing them to the tempo of your track.